Arctic Blast™ Freeze Spray is the newest class of circuit coolants, specifically formulated to quickly cool surfaces while minimizing the use of global warming compounds. It is formulated with HFO-1234ze, a new material that has a significantly lower global warming potential (GWP) than previously used materials. 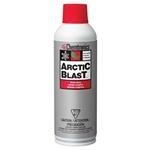 Arctic Blast™ Freeze Spray is nonflammable, residue-free and provides fast cooling action.